The most official way to make your interests, hobbies and quirks known to the world is through a license plate. As these twenty hilarious vanity plates show, Americans are really messed up. 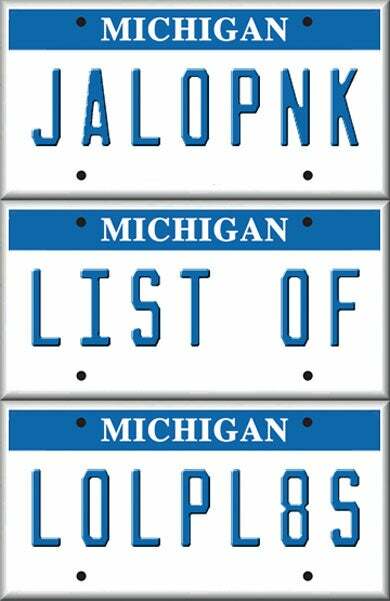 And when you're done enjoying the twenty hilarious vanity plates here, head over to the 50 Plates That Slipped By The DMV, and then go to the Michigan Plate It Your Way site and try your own, which we invite you to add to the comments below. Meaning: Seriously, we hate that Madoff guy. We were going to buy a Bugatti but were forced to settle for this. Meaning: I love my M3. You should also check out my Audi A6: AAAAAA. Meaning: Either he thinks he has an M3, or he loves bacon. Meaning: Since this was taken from Craigslist it's clear this seller is being completely honest about the slow nature of the car. Car Shopping? A Slow P.O.S. Might Be Right For You! Meaning: "No, Mr. Officer, we always light incense in the car." Meaning: Who knew the Swedish Pirate Party had a base in Virginia? Meaning: The rest of the license plate was supposed to read "Franklin@." Meaning: "This is Moe's Tavern. Hold on. Is there a Mr. Meoff here? A Mr. Jack Meoff?" Meaning: So there's the official vehicle of the L.A. branch of the Jamaican Growers Association. Meaning: We think you and UNWED guy should hang out. Meaning: We think the meaning is pretty clear — this person does not like Ohio. Meaning: I'm in the middle of a midlife crisis. Help! Meaning: This person sells Port-a-Johns. Meaning: Oh no, he's going to PWN us in his FWD crapbox! Meaning: This guy washes his hands, a lot. It's Jalopnik! Include your hilarious vanity plate below using the Plate It Your Way site.